I have a love of stamps, especially air mail stamps. There’s something romantic about envelopes bearing colorful and exotic stamps, and the receipt of a letter in a red- and blue-striped envelope with “par avion” marked on the outside holds all the promise of great adventure in foreign lands. Many of you know that I write letters to my nieces for them to save and open when they turn 18. Along the way, I send letters from different countries I journey to and ask at the post office here in Thailand for the latest and most interesting stamps, so that when they sit down with the letters as adults, they enjoy a journey even before opening them. I must say, though, that I’ve grown tired of the Thai Post Office “air mail” stamp. 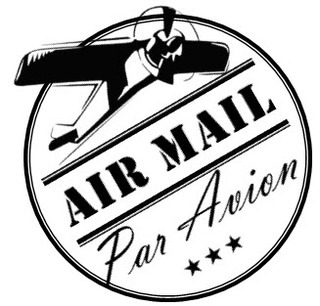 I’ve recently thought about having a rubber stamp or two custom made with my own air mail logo. Browsing the internet, I collected bits of clip art and sat down last week to create some potential designs. Lacking Photoshop or Adobe Illustrator, I instead used PowerPoint and SnagIt to create and manipulate these images. Your thoughts and opinions are most welcome. #1 – My initial design was very simple, perfect for a rubber stamp. It features a plane that looks to be a Ford Tri-Motor and some simple text, with French, naturellement! #2 – Advancing the design a bit, I decided to get more martial in my font choice. This would certainly capture the attention of the employees at the postal service. I continued my experimenting with a new airplane image, one with a transparent background that let me lay the image over text and other graphics. Design #3 was my first attempt with the circular logo, playing around with PowerPoint’s word art feature until I figured out how to use it. Design #4 introduced stars and saw the plane heading in the other direction, which gives it an altogether different feel. The next two designs made use of rotating everything 270 degrees, which is a little silly considering that with a rubber stamp, I could just hold the stamp at an angle. No need to design everything at an angle, too! Anyhow, design #5 simplified the circular border and had the airplane’s wing and propeller breaking the border, which is a dynamic effect. 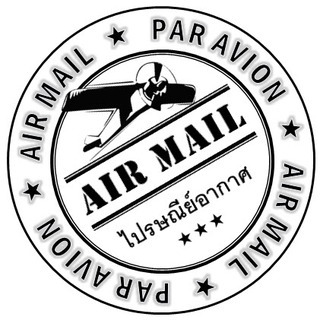 In design #6 I returned the second circle and also introduced the Thai phrase for “air mail”. Feeling that I had neglected modern aviation, design #7 introduced the silhouette of a Boeing 737 Next Generation and a simple text box. I played around with it to have the airplane’s tail and landing gear break the border of the text box, giving it a little bit of dimension. 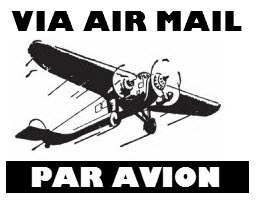 I started to wonder whether, instead of making a rubber stamp, I should just have the air mail logo printed as an adhesive stamp, an inexpensive prospect. So I created a series of designs to explore that idea. #8 has a nice “out of the box” effect. #9 is similar but introducing color and moving the Thai to align with the English and French. #10 played with the idea of inverting the colors, which is interesting. Next, I decided to revisit the classic air mail envelope, but couldn’t decide how to end the stripes. #11 complements the angle of the italic letters while #12 has the 90-degree angle of a classic letter envelope. My final two designs were a little more art deco. #13 is an original and took some time to figure out how to make the airplane image come together correctly. #14 is an homage to a classic stamp I saw online, with a few small changes. So what do you think? Which one(s) do you like and do you think I should go rubber stamp or self-adhesive? This entry was posted in Uncategorized and tagged Air, aviation, envelopes, Letters, mail, stamps by christao408. Bookmark the permalink. Everything looks awesome! Great work! For whatever reason I gravitate to the circular designs! I like 2, 4, and 6!Great designs! Nice work, Chris — I love #1, #7, and #13. Interesting that you should still need these — any (I believe that may be ‘all’) mail here automatically goes by air. They are all good… Why not do adhesive stickers and do different designs? We made up stickers for giving out to students when we visit classrooms and the company was very willing to put 4 designs on each roll… kind of like the self adhesive gift labels… Then you could vary them each time. We had round and rectangular stickers done but the round ones cost more. They are all very good! I venture to suggest #9 using a 737 logo instead. Only just because I am practical and want to make sure your cute Thai postman recognise the logo and thai landuage. If your intent was for your niece to collect, maybe murisopsis idea of sticker would suit the purpose to the tee. @murisopsis – greeat idea of multiple designs on stickers. You’re a man of many talents! I would go with stickers instead of stamps. I think you’ll probably come up with several designs to use. The designs are all good and it’s hard to pick. I like the classical round shape but I’m not sure if you can do that on a sticker. #7 to #10 are very interesting (btw – what happened to the wheels?). #13 reminds me of something I’ve seen when I was a kid.This is interesting. I used to collect stamps when I was a kid (thanks to my dad). He would use it as a chance to teach us about the different countries. You’re a great uncle to your nieces. I like #1 as my first choice…it has a feeling of lift to it both in the direction of the plane and the font. My second choice is #13…interesting combination of text and plane, well balanced to my eye. To incorporate Thai into the design, I prefer #9…there is still the effect of the plane “outside the box”, but better balance with the three lines of text. I don’t particularly care for the circular one,can’t put my finger on the reason why. Something seems out of balance on them. I would recommend self-adhesive stickers. They are probably more expensive over the long run, but I think they would be more versatile. Old fashioned rubber stamps require ink pads which are messy. Newer stamp pads are self-contained and less messy,more expensive initially, but perhaps not as versatile.Keep us “posted” on the progress of this project. I have little imagination #13 = make it as paste on. My picks are #5, #8, and #13. Both stamps and adhesives should be fine. I once designed an Ex Libris stamp that uses a rubber stamp. I think adhesives are easier to deal with, but no idea about longevity or these. A stamp probably lasts longer – on where you stamp it I mean. #s 1, 6, 7 and 13. My Gawd, Chris! You are amazing. I am not sure about #s 8, 9 and 10, because the underbelly of the plane looks a little concave, and don’t show the wheels.This is such an excellent post. 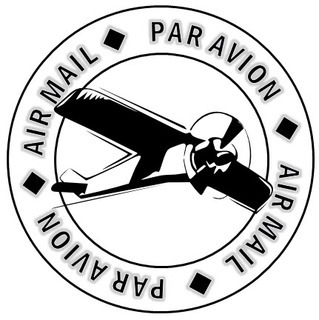 I too love receiving and sending letters with the Par Avion stamp on them. I think you could have some stickers, and some stamps, so you could fool around with them, and your nieces will keep guessing which one the next letter from uncle Chris would carry. This post definitely needs a huge rec. I have a huge stamp collection although I haven’t worked on it in quite awhile. My Dad always made a big fuss when he came home from the PO back in the 50’s with a new stamp. Those stamps still have a special place in my heart. We’re putting together a stamp jigsaw puzzle on the dining room table right now. I’ll have to look and see if there are any par avion. Great post! Merci. I used to collect stamps before the days of email. I had penpals from all over the world and everyday, I would sit by the window waiting for the postman. Now all I get from the postman are bills, bills and more bills. Now my Xanga friends are like my pen-pals. I like #6 and #12 and I prefer rubber stamps. In love with the 5th! I like #6 quite a bit, however, I don’t think a stamp can duplicate the shaded outline to the text. Instead of a stamp or stickers, couldn’t you just print them out on your printer? not sure about rubber stamps or adhesives but i really like the 4th design. you’re quite the artist! @M_1 – I could print them out on my printer but… that doesn’t seem like as much fun. @icepearlz – Oh, I like that sentiment. I, too, think of Xangans as my pen pals now that we’re in the day of electronic communication. I do have a few friends with whom I trade correspondense the old fashioned way. Definitely like the plane in #3, 4, 5 better.Can’t read the font as well in #1. I like the font in #2 but not the plane. #3 reminds me of casino chips. Do the 3 stars mean anything in #4? And perhaps I would like the two stars to be at 3 and 9 o’clock position. I like #5 but just not tilted. The “P” overlaps with the circle though. #6 is casino chip again. #7 reminds me of Southwest Airlines. I like #8 and #9 too. But perhaps more #9 in black. Would you continue using it in the U.S. though? Might want to think about adding Thai or not. Don’t like how the corner cuts off in #10. I like #11 and #12 but anyway to tilt the font more to match the angle of the borders? Not feeling the last two. As for sticker vs. stamps, probably sticker so they can be in color and are cheaper, you can give them out even as gifts if you want, re-designs are cheap too. My favorite is number 6; good shape, and I like the interaction of Thai and English texts with the geometric shapes. You’re an interesting guy! I like the round ones. #2 is my favorite. Thanks to everyone for their feedback. No clear winners although designs 13 and 6 enjoy a slight lead. @ThePrince – Why, thank you. I’d like to think that those graphic design classes I took helped a little…@Proud2B2003 – Isn’t that the truth? Bills, bills, bills. In fact, I’ve had several friends who didn’t receive cards until well after they were sent, not because the cards took a long time to get there but because they only check their mailbox every few weeks! @nurseynursey – A stamp jigsaw puzzle? What a pleasant coincidence to my topic! Thanks for your comment. @ZSA_MD – Thanks for the rec. As soon as I figure out what to do with these – printed label or rubber stamp – I will have to send you a letter so you can see the end result! @beowulf222 – Yes, I think a rubber stamp has kind of a nice lasting quality to it. But maybe labels are more practical. But then emails are more practical and I still hand-write letters, so when did practicality become a consideration? @AppsScraps – Adding Thai does often give things a little something that can only be described in French. Ha ha…@jandsschultz – “Keep us posted…” har-har-har…@ElusiveWords – Not sure what you mean by your question. The airplane in designs 3-6 and 8-10 is different than the one in designs 1 and 2 and doesn’t have wheels. @stevew918 – Oh, I think the postman might be more familiar with a propeller plane than a jet! 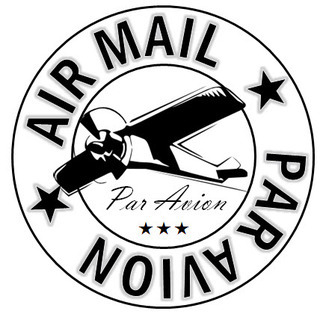 =D@slmret – My guess is that you are right and air mail is the defaul, stamp or otherwise. But I know that if I bring a letter to the post office here, they ask what class I’m sending it and add the “air mail” stamp. @Roadlesstaken – Guess you’re just a circular thinker…. @murisopsis – That is a tremendously practical solution, Val. Maybe I’ll do both labels as well as one or two rubber stamps. @oxyGENE_08 – @TheCheshireGrins – @Cestovatelka – @AimeeFrying – Thanks for your compliments and votes! @everyday_yogi – First vote for #3, actually. Thanks. @bengozen – Thinking about the monochrome versus color issue is important, even if we’re talking stamps and not logos. Ultimately, an effective design like this should work in a variety of settings. Good feedback, thanks. @Devilzgaysianboi – Thank you. Of course, another way to say “creative” is “isn’t there something more productive I should be doing with my time! ?” =D@jace1982 – I was thinking I could introduce some color into #1, too, and print it as a label rather than a monochrome rubber stamp. if you going to use them exclusively for mails OUT OF Thailand, then i’d pick #8-10. it’s simple, not too big but large enough to be legible and visible, and it has a thai touch. with this design, you can also play with the choice of colors to suit the color of the envelope. @rudyhou – Ah, good point. Hadn’t considered color coordination with the envelopes. Thanks for mentioning that.